Henry Louis Gates Jr. (left), the event’s host and director of the W.E.B. Du Bois Institute, shared a moment with medal recipient Steven Spielberg (photo 1). Gov. Deval Patrick garnered laughter during his introduction (photo 2). Sonia Sotomayor (from left), David Stern, and Tony Kushner didn't let the evening's lighter moments pass them by either (photo 3). When the stars come out, it is not always nighttime. Take, for instance, the W.E.B. Du Bois Medal ceremony on Wednesday afternoon at Sanders Theatre. The six medalists included a White House adviser (Valerie Jarrett), a playwright with a Pulitzer Prize (Tony Kushner), a U.S. representative called “the conscious of Congress” (John Lewis), an associate justice of the U.S. Supreme Court (Sonia Sotomayor), the commissioner of the National Basketball Association (David Stern), and a Hollywood director with three Oscars (Steven Spielberg). The medals, awarded since 2000, go to writers, artists, philanthropists, and others for outstanding contributions to African-American culture. Even those introducing the medalists had star power. In the front were Harvard Law School Dean Martha Minow and NBA Hall of Fame player Bill Russell. Nearby was Massachusetts Gov. Deval Patrick, Harvard President Drew Faust, and Tony Award winner Diane Paulus, artistic director of the American Repertory Theater. Also in the front row, ready to present one of four readings from W.E.B. Du Bois, was Wole Soyinka, the 1986 recipient of the Nobel Prize in literature and the first African laureate. He is a Hutchins Fellow at the new Hutchins Center for African and African American Research. 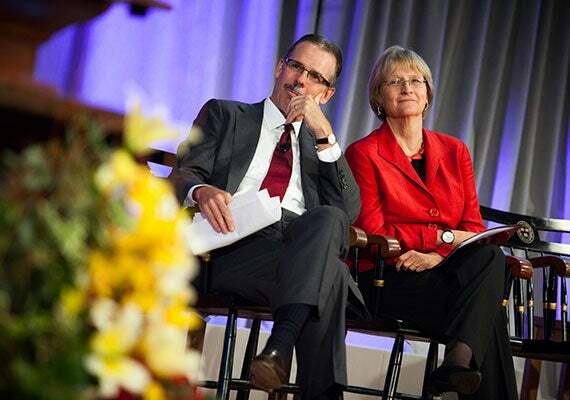 Glenn H. Hutchins and Harvard President Drew Faust shared the stage during the star-studded event, which marked the inauguration of the new Hutchins Center for African and African American Research. The center, with Gates as its first director, was itself a star of the event, which marked its inauguration. The center brings under one roof the W.E.B. Du Bois Research Institute, the Hiphop Archive & Research Institute, the Image of the Black Archive & Library, the Du Bois Review, Transition Magazine, the Neil L. and Angelica Zander Rudenstine Gallery, and the Hutchins Family Library. Four new entities will reside at the center, too: the Afro-Latin American Research Institute, the History Design Studio, the Program for the Study of Race & Gender in Science and Medicine, and the Ethelbert Cooper Gallery of African & African American Art. The center made Glenn H. Hutchins ’77, J.D.-M.B.A. ’83, yet another star. He endowed the Hutchins Family Foundation, which made the center possible with a gift of $15 million. Hutchins took the podium next, thanking Gates after his lengthy history lesson for “the wonderful words,” and then promising — to laughter — to say fewer of them. Apologizing to Spielberg, he showed a video about the Hutchins Center. That too was a star-heavy production, featuring Harvard’s William Julius Wilson, Evelyn Brooks Higginbotham, and Lawrence D. Bobo, all of whom did readings from Du Bois during the ceremony. Also on screen were Faust, Lawrence Summers, Neil Rudenstine, Robert Rubin, Robert D. Reischauer, Dean Michael D. Smith of the Faculty of Arts and Sciences, and Marcyliena Morgan, executive director of the Hiphop Archive. Paulus introduced Kushner, praising him for his “fierce intellect,” his “wild imagination, and deep, deep compassion,” and noting his numerous awards, including a Pulitzer, two Tonys, three Obies, and, earlier this year, the National Medal of Arts and Humanities. The Du Bois medal “is named after one of my heroes,” said Kushner, and was bestowed by another, Gates. 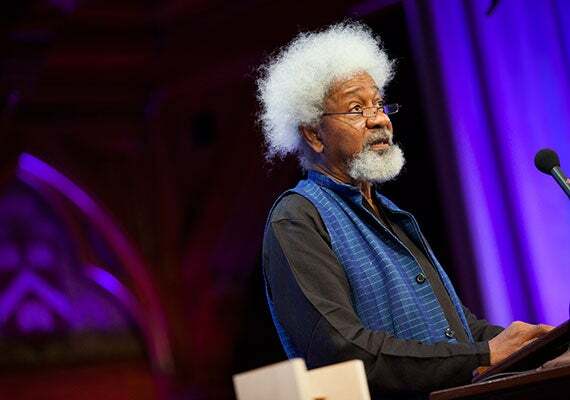 Wole Soyinka, the 1986 recipient of the Nobel Prize in literature and a Hutchins Fellow, presented one of four readings from W.E.B. Du Bois at the event. Stern is retiring next year after 30 years running the NBA. A towering Russell, age 79 and sporting a gray goatee, rose from his front-row seat and loped slowly across the stage to introduce him. “A few years ago, I used to send checks” to Harvard, said Russell, a reference to his youngest daughter’s years at Harvard Law School. At her graduation, he said, she asked him to take a picture — so he turned his pockets inside out. When Minow introduced Sotomayor, she said the medal was going not only to an accomplished jurist, but “to Sonia from the Bronx.” Sanders lit up with cheers. Hutchins discussed Lewis, a veteran of the Civil Rights Movement who by age 23 had been arrested 24 times and who in 1963 was the youngest speaker during the famed March on Washington. He is the only surviving speaker from the day of Martin Luther King Jr.’s “I Have a Dream” speech. Wynton Marsalis' penultimate lecture and performance in his series “Setting the Communal Table: The Evolution of the Jazz Orchestra” centered on jazz’s exploding popularity from the 1920s to the early ’40s. He performed with the help of pianist Dan Nimmer (photo 2) and an orchestra (photo 3).